Isabelle lives with her father on a farm. She likes the seclusion and doesn't mind helping out with the chores. Isabelle doesn't have any friends. She's being bullied at school because of her paranoid schizophrenia. Isabelle's closest companion is her dog Pickle. After a terrible storm Isabelle starts noticing strange things that are happening to the people around her. What is going on with them and how can she make sure she's safe from whatever they have planned? Are problems with her medication the cause of her worries or is something sinister going on? 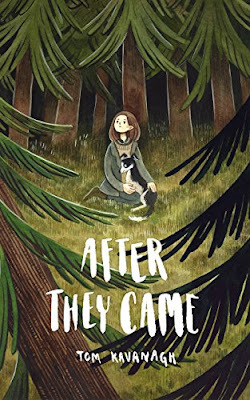 After They Came is an impressive story. Isabelle struggles with her mental illness. She's a sweet girl, but because nobody really tries to understand what she's going through she's terribly lonely. She could use a lot more support and it was sad to see how she has to fight her demons on her own. Something is chasing her and I was intrigued by the realistic way this part of the story is being told. It adds a lot of depth to the story and makes it really good. Tom Kavanagh describes her problems in a beautiful raw and emphatic way that moved me to tears. I kept hoping Isabelle would find someone who'd understand her and that people would see the wonderful person she is. Tom Kavanagh has written a poignant and compelling story. It's heartbreaking to see what Isabelle is going through, the chaos she has to find a way to deal with. Living with paranoid schizophrenia is difficult and I loved the open way Tom Kavanagh writes about what she's facing. He combines this with a terrific story about family, new beginnings and friendship. I was greatly affected by After They Came, it's a fantastic book. If you love moving YA you should definitely read After They Came. It's a fantastic story about mental illness that shouldn't be missed. Sounds like a very special story. A very difficult struggle the heroine has, and the plot is intriguing. I don't tipically read YA anymore but it's sounds like something I'm going to recommend to me little sister to check out. I actually quite love stories about mental illness. Thanks! I really like YA adult that features mental illnesses, i will likely check this out soon! I think this would be a difficult story to read. Because of the emotional turmoil I think it would cause me. It sounds like a very emotional read and a good story. I'm curious about those strange happenings. This sounds interesting, with her living on a farm and also having a mental illness. I am curious to read this one and find out more. This sounds like a nuanced examination of an uneasy topic! I will currious to read this book and wonder how it ends. Great review. The Cover is quite unique! I loved Tom's 'Quiet Boy' so look forward to trying this one!